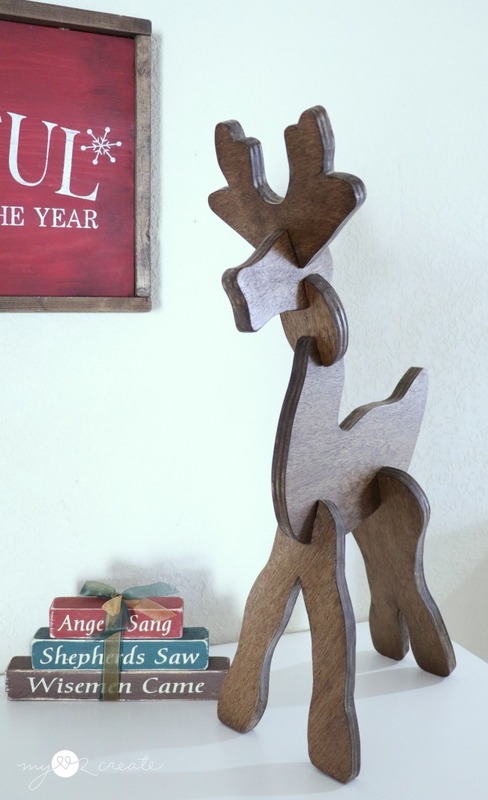 You guys are going to love this family favorite...a DIY Wooded Reindeer Puzzle! 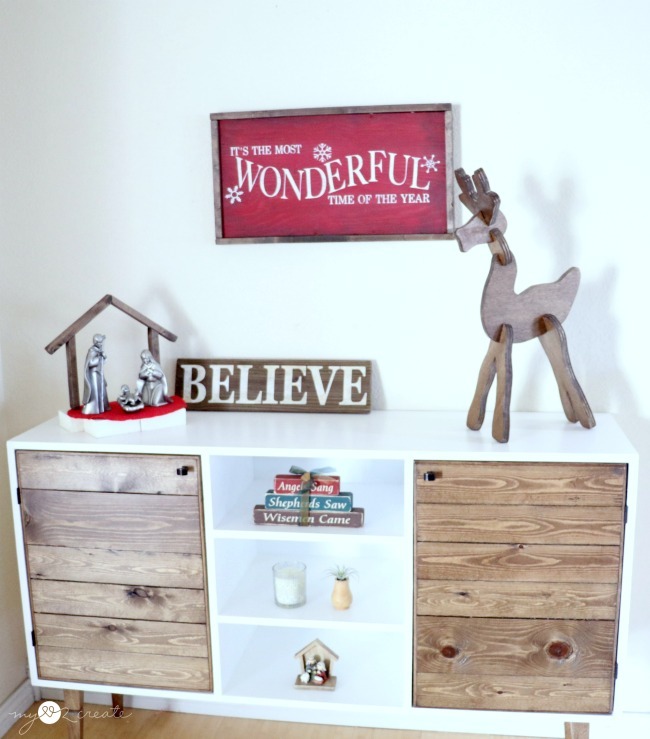 Not only is it perfect for your holiday decor, but it is also fun for the kids or grandkids! 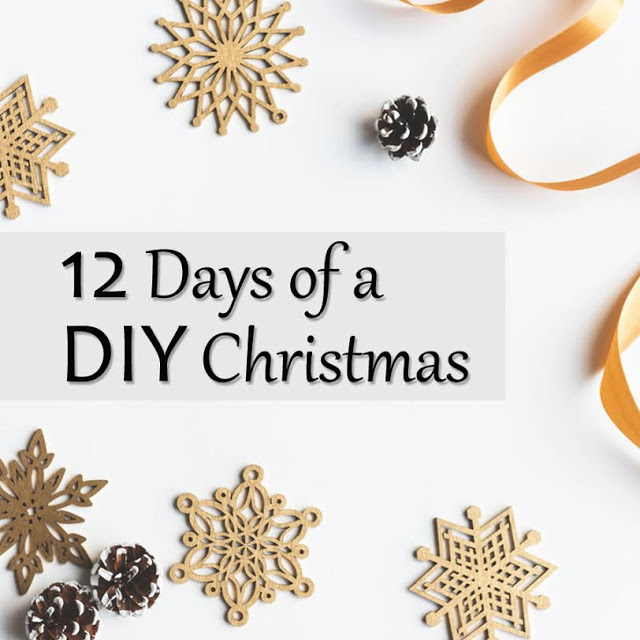 Did you see my post last week on 12 Days of a DIY Christmas? Well, today is my day #8! If you haven't been following along you NEED too, all the projects are super fun! This post contains affiliate links that help you find what you need and also help me too! Read More. 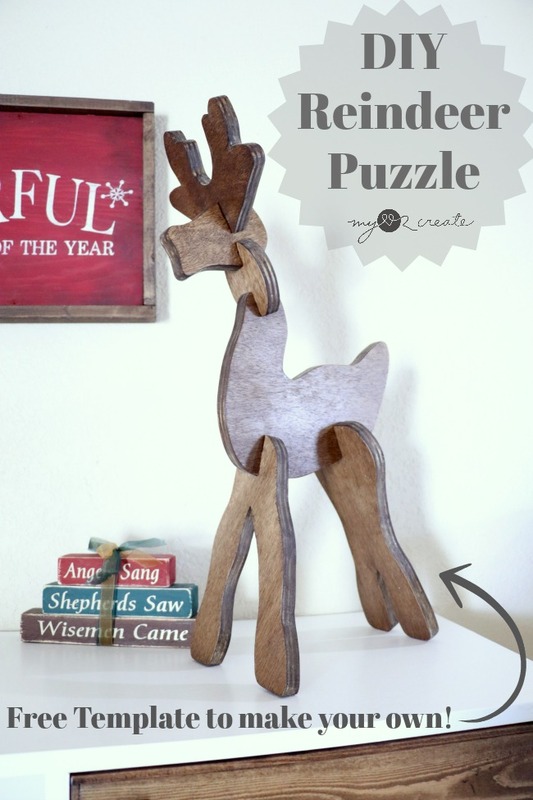 Get your pdf Puzzle Reindeer Template Here! 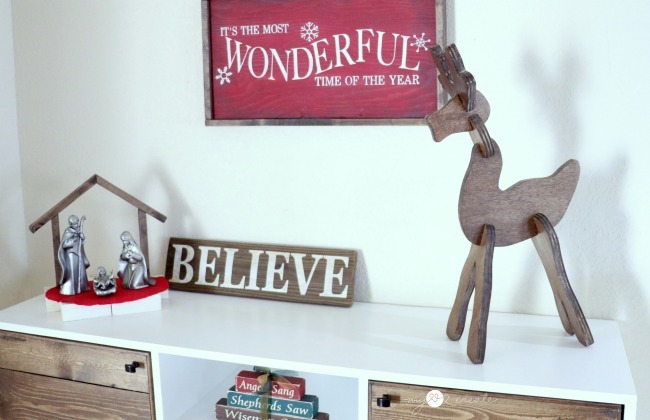 Print and cut out all six parts to the reindeer template. 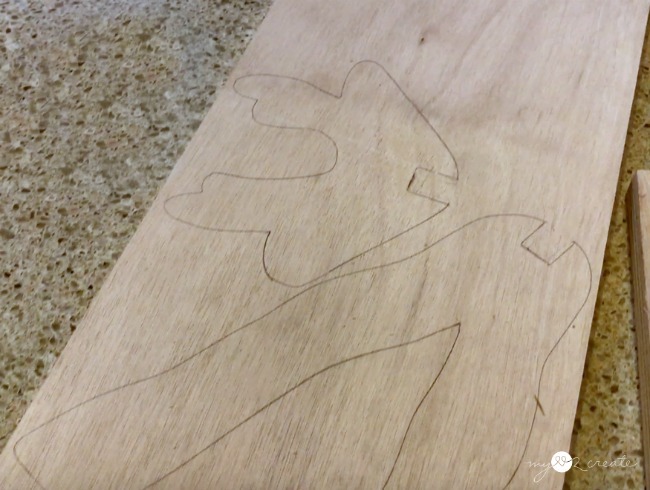 All parts you will cut and trace onto the wood as a whole piece except the back legs, since they did not fit onto an 8x11 sheet of paper. Cut the back legs as shown above down the center line. 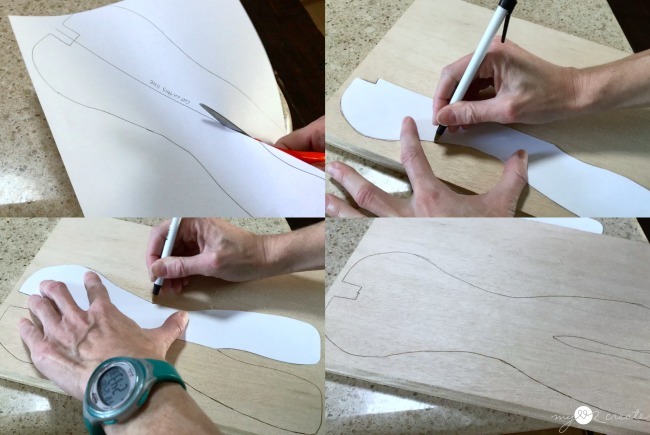 Trace that half of the legs onto the wood, flip the template over, and trace the other half. Done! Stagger the pieces as best you so you can use as little wood as possible. The pieces fit onto a part of 1x10 board or you can use scrap 3/4'' plywood. 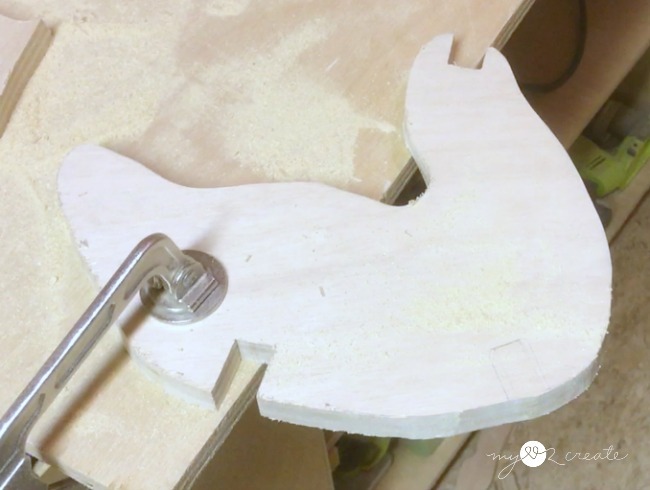 Clamp your board to your work surface with the part you are cutting hanging off the edge. You will need to constantly clamp and re-clamp to adjust as you cut your pieces. 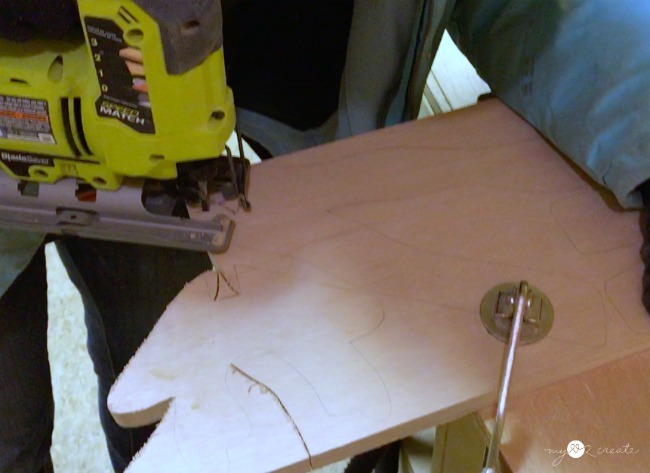 Use relief cuts, or straight cuts into the wood of a cut out section (see above). These are helpful as you are cutting curves or tight spaces because the wood falls away once you reach the relief cut. Make sure your notches match the width of your wood. Technically you could cut this pattern out of 1/2" plywood, but you would need to adjust the notches to 1/2''. 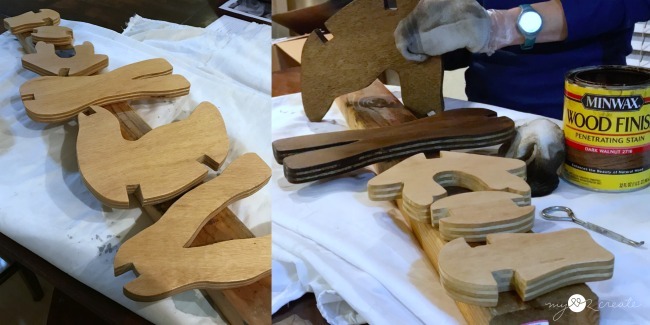 After sanding all the pieces and the edges I gave my reindeer puzzle pieces a coat of Wood Conditioner . Then I stained it with Dark Walnut stain. When sprayed it with This Sealer , after it cured it was ready for display...or in our house...PLAY! 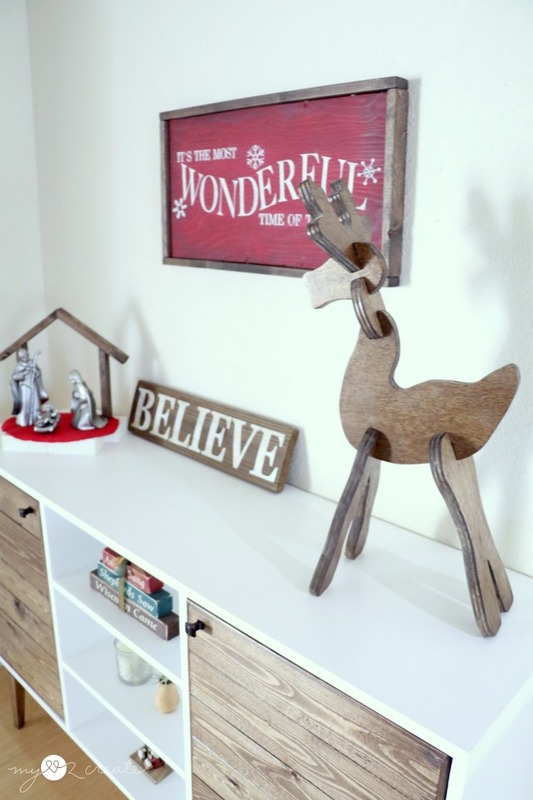 But when it isn't being played with this little wooden reindeer puzzle looks mighty cute on my Modern Rustic Buffet next to my Pottery Barn Knock off, "It's the Most Wonderful Time of the Year" Sign. Of course he is cute on the floor too, or anywhere! My kids want to add some Googly eyes , which we may...I just don't have any right now. I also think a little bow or ribbon around his neck would be cute too. So what do you think, is this little guy one you would like to make? Thanks for reading and I hope you are enjoying this holiday season! Mindi, I love it so much! Thanks so much! It might just be my first project on the scroll saw! I love this Mindi, it turned out so cute!! It reminds me of one my in laws used to have but I accidentally broke! Now I can make another one!